MILAN (AP) — On both sides of the Atlantic, migrants flooding across borders by the hundreds each day have met a hostile reception and governments unable to agree on how to cope with the arrivals. In Europe, where far-right parties have joined the governments in Italy and Austria and made gains elsewhere, even the most basic decision of which port would accept a ship filled with migrants has been fraught. On Tuesday, yet another rescue boat loaded with migrants struggled to find safe harbor in the Mediterranean, while in Austria police cadets playing the role of desperate refugees rattled a chain-link fence demanding to be let in as part of a high-profile training exercise to test the mettle of a new border force charged with preventing an influx of migrants. "We have had migratory crises in the past, but that is not what we are going through now. What we are living through now is a European political crisis," French President Emmanuel Macron said after a daylong meeting with Pope Francis at the Vatican during which they discussed the issue. The European crisis mirrors the one in the United States, where a broad-ranging Republican immigration bill was set for a vote Wednesday, with little certainty that it would survive. With legislation in disarray and a global uproar over the separation of more than 2,300 migrant children from their parents, the Trump administration abruptly reversed a key element of its zero-tolerance immigration policy last week, halting the practice of separating immigrant families caught illegally crossing the border, but leaving more than 2,000 separated children in limbo in government-contracted shelters. The standoffs in Europe involve multiple governments, all running their own immigration policies but with open borders among them. Twice this month, as calm seas and warm weather spurred greater numbers to set sail, rescue ships filled with migrants have been left in a holding pattern in the Mediterranean. The latest standoff involves the German-operated Lifeline, which has sailed for five days without safe harbor. France, Portugal, Italy and at least one other country agreed to divide up the migrants on board, and said Malta would take in the ship. But the German aid group operating the ship said Malta had sent a message refusing entry into its territorial waters, further confusing an agreement that had taken days to negotiate. Malta also flatly refused to accept an empty rescue ship, the Aquarius, which needed some mechanical work before it could resume its sweeps of the Mediterranean. The ship headed to the French port city of Marseille instead. It was the Aquarius that touched off last week's showdown, when the ship, operated by French aid groups and carrying 630 migrants, had its journey to land extended by a week after Malta and Italy refused docking rights. Spain ultimately accepted the passengers, and the Aquarius traveled an additional 1,500 kilometers (900 miles) to get there. "It's five useless days to come here when the Aquarius is not on the migrant route to rescue, and that's a shame in terms of saving human lives," Frederic Penard of SOS Mediterranee said in Marseille, where the ship was expected on Friday. Italy, which believes the rescue ships operated by aid groups only encourage more migrants, also refused docking in Sicily. Italy's new right-wing interior minister, Matteo Salvini, has contended that the rescue boats essentially provide "taxi service" at sea for the human traffickers. But with calm seas and fair weather, more migrants continued to take their chances crossing from North Africa. Spain's Maritime Rescue Service picked up over 400 people from the Mediterranean on Monday, bringing the total number of rescued migrants to around 1,800 in just four days. Macron has pushed for asylum demands to be processed in North Africa before the rickety boats attempt the crossing, but so far no country in the region has agreed to play host. Algeria has expelled more than 13,000 migrants into the Sahara Desert since last May, forcing them to walk without food or water, according to an Associated Press investigation. And in Libya, which has turned back dozens of migrant boats, there have been complaints of rampant human rights abuses against migrants in detention. On Tuesday, Austrian police staged a high-profile training exercise simulating an influx of migrants along its frontier with Slovenia to demonstrate how it would deal with such a crisis. Hundreds of officers in heavy armor, backed by soldiers and Black Hawk helicopters flying overheard, performed a dry run for the media near Spielfeld, 175 kilometers (110 miles) south of Vienna. The town was a major crossing point for migrants in late 2015, but has hardly seen any arrivals recently. 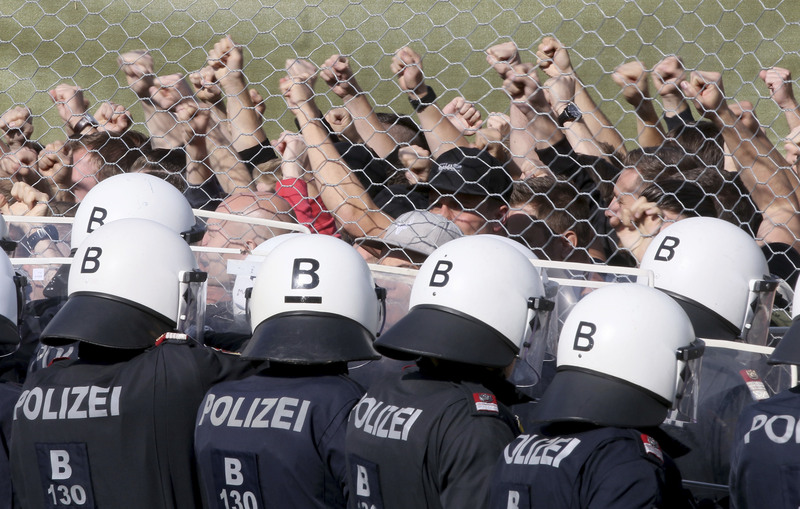 The "migrants" were played by 200 Austrian police cadets, who chanted and rattled a metal fence, demanding to be let in. Austria's top security official said the exercise was necessary and lawful, dismissing concerns at home and abroad. "A state which, if things come to a head, can't protect its borders effectively, loses its credibility," Interior Minister Herbert Kickl told reporters. "I'm strongly determined that events like those in 2015 must never happen again." "This has nothing to do with inhumanity, this isn't unlawful, this isn't indecent," he said. "This is what the law demands from us. It is what the people expect from us." Kickl's far-right Freedom Party has pushed for a hard line against migrants for years and saw a surge in support following the 2015 migrant crisis, when thousands of people fleeing war and hardship in the Middle East and Africa poured through Europe's open borders daily, triggering a humanitarian and political crisis that has left deep divisions on the continent. This summer's numbers come nowhere near the 2015-2016 migrant crisis, but German Chancellor Angela Merkel is under heavy pressure from conservative allies in Bavaria to turn away migrants who come through other European countries. Merkel, whose decision to allow migrants stuck in Austria and Hungary to come to Germany was initially welcomed by voters, has warned that unilaterally closing borders could trigger a string of national measures by individual countries that would further divide Europe. Speaking in Berlin, Merkel said most EU countries are more concerned about preventing migrants from illegally entering Europe in the first place. Neighboring Slovenia protested the Austrian exercise, saying its own forces are already doing enough to protect the borders of the Schengen travel zone within which Europeans can travel freely without passports. "I even see (the exercise) as somewhat provocative," Slovenian Prime Minister Miro Cerar said Tuesday, according to the official STA news agency. Cerar said the number of migrants entering Austria from Slovenia has not increased and described his country as an "exemplary" protector of the Schengen border. Meanwhile, Martin Sellner, who heads Austria's white nationalist Identitarian Movement, applauded the fact that authorities were using the same "#proborders" hashtag favored by his group to inform the public about the exercise. Macron said that these were the battle lines being drawn in Europe, with migration at the center. "We are not good at this subject, either in Europe or in France," he said. "But we have a society to lead." Articles by The Associated Press, The AP.